If you have a conference, meeting, exhibition or corporate event of any nature coming up and are unsure where to start or simply require assistance, why not let our highly experienced in-house staff give you a helping hand? Our venue-sourcing, events and production teams will use their extensive experience to provide you with a creative event solution, based on your requirements and budget. 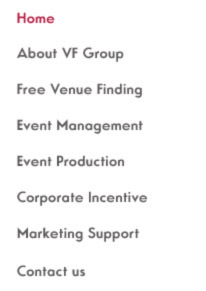 VF Group, formerly known as Venuefind, has been managing events successfully since 1994. We run a wide range of services, from initial free venuefinders to full on-site event production. We can successfully find you a venue in London and in worldwide locations such as Europe, South Asia, Middle East and USA. No event is too large – or too small from B2B conferences, seminars, exhibitions, training courses, product launches, and round table events to highly effective events such as Olympic events, festivals, outdoor events, fashion shows, incentives, high profile parties and gala dinners. Each one is handled with our renowned professional care, to ensure excellent service and value for money. VF Group is run by a pre-eminent professional team which is among the most experienced and talented in the industry. Our philosophy has always been that, from initial brief to event completion, we aim to meet and exceed your expectations; whatever your budget or requirements, we will have the solution to suit.